As I understand it, the newer classifications with a cladistic leaning don't view Reptilia as a valid classification anyway. Crocodiles and pigeons are apparently more closely related than either is to cobras, and we mammals share a common ancestor with all three of them. Correct, but we have to classify them as something. But we're digressing, since crocodiles, snakes & lizards wouldn't be reptiles either, not just the dinosaurs. I've never been convinced about not being able to name paraphyletic groups. Why can't we call them the paraphyletic class Reptilia? It happens elsewhere, after all. Here's a related question, are mammals amniotes? Or is the amniote group paraphyletic? 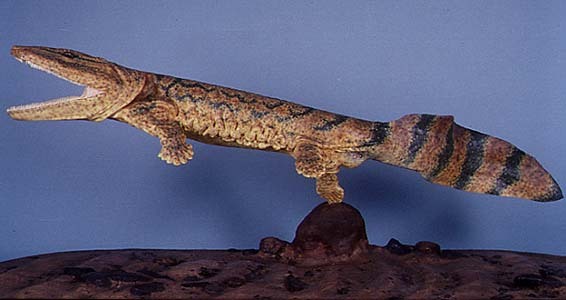 Amniotes, along with modern amphibians, may all be descended from Acanthostega or some similar beast. I don't think that the fossil record is quite complete or detailed enough as yet to say with any authority whether amniotes proper arose once or twice. I'm currently reading Gaining Ground by Jennifer Clack, and that seems to me what she is implying - and she's one of the heavy hitters in the Devonian/Carboniferous paleo game. I can't remember where I saw it, perhaps it was something from Dawkins or Gould, but I seem to recall something about that many different forms may have started over. Of course, it would not be that another amphibian type creature would have given rise to another salamander or frog, but they alternate amphibians would have lived on the land and be born in the water. My poor example not withstanding, does anybody else recall this type of multiple starts for a myriad of different creatures or did I get it wrong? Why can't their be endotherm members of the reptilian class? I believe it is simply a matter of definition. Gaining Ground is sitting on my bookshelf, once Vertebrate Palaeontololy (Benton) is finished, Clacks book is next on my list. It looks pretty exhaustive stuff! Regardless, that's precisely my meaning, if mammals aren't amniotes, then amniotes don't exist because it is a paraphyletic group, just like reptiles, right? Do you see what I mean? Benton takes care to describe groups as monophyletic or paraphyletic, so I don't see why any cladistician should be offended if we accept that the reptile clade is paraphyletic. What should we call reptiles before birds & mammals diverged, if not reptiles? It seems a silly rule to slavishly follow to refuse to categorise post-bird-divergence reptiles the same as pre-mammal-divergence reptiles. Surely the point of classification is to identify synapomorphies, & group organisms into a nested hierarchy using those traits? If reptiles & basal amniotes possess the same traits, then surely they should be classified similarly, though as I have said, the group should be accepted as being paraphyletic. In addition to my earlier post that all fossils are transitional, I offer three living transitional species: penguins (whose feathers blend into something very much like scales on the back side of the wing), duck-billed platypus (lays eggs, has mammary glands, and a beak), and the polar bear (obviously a regular bear physiologically, but behaviorally very much the aquatic mammel, i.e. earth to sea, bottle-nosed dolphin?). Can anyone solve the riddle of this mneumonic? I'm suprised at the lack of feedback on this last couple of paragraphs. No comments, pro or con? Kingdom, Phylum, ? ?, Class, Order, Family, Genus, Species. How about Many Volcanoes Erupt Moldy Jam Sandwiches, Usually Not Palatable? Sorry. I duplicated this, somehow, in the post below. Oh yeah, I hate it when I miss the obvious! My very enlightened mother just served us nine pickles.